Each BYU Homecoming, George H. Brimhall descendants sponsor an essay contest honoring a BYU founder. Law student Sarah Page Clifford (BA ’15) won the 2017 contest, which recognized former football coach R. LaVell Edwards (EdD ’78). A condensed version of her essay is below. LaVell Edwards was raised blue, and the color seeped into his bones. As a lanky boy, he scrambled up orchard trees adjoining the practice field to glimpse the BYU football team. His dream was to be a coach. Between bites of pancake and gulps of milk, I would imagine my own college story. Sometimes I imagined I was studying English and living in the dorms. Other times I was studying geology and sharing a room with my best friend off campus. All those dreams had one thing in common: they took place at BYU. I checked again. . . . You didn’t get into BYU. I’m sorry. When LaVell started as the new head coach, he wasn’t sure he had a future at BYU either. 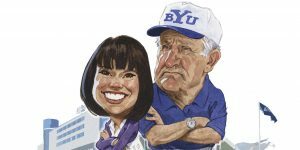 Turning the lackluster Cougars into a national powerhouse was a feat no other BYU football coach had been able to accomplish, and although he had 18 years of coaching experience, LaVell had just four winning seasons to his name. Many—including LaVell himself—assumed he would be fired as soon as BYU could find a more qualified coach. To everyone’s surprise, the Cougars started winning. LaVell described the key to their success: “We did things differently.” Instead of running the ball down the field, the Cougars began passing it. He proved that surf-loving Californians could be persuaded to play in frigid Utah by inviting them to play in the Sundance snow. He encouraged returned missionaries to play for the team despite time away. In short, LaVell threw out the football bible and wrote his own rulebook. Buoyed by the hope of transferring, I too threw out the traditional guide to getting into BYU and started writing my own rulebook. On weekdays I rushed home from high school to bookmark GPA requirements and transfer-student statistics. On Saturdays I drafted Excel spreadsheets, itemizing transferable classes from local community colleges. I created a game plan to reach the required 24 college credits. That summer I put my plan into play. While my friends sat at the pool, I sat at the kitchen table, sipping my glass of milk and reading about how Piaroa tribe members build social identity by eating the legs of tarantulas because Rio Salado College’s sociology 101 fulfilled BYU’s social-science GE credit. Sociology taught me you are what you eat. My breakfast tasted like grit and homework, but I washed it down with my desire to become a Cougar. I completed 17 credits that summer. Like LaVell, I did things differently. And as I did, I learned that being strong meant picking the grit out of my teeth, swallowing that homework, and then waking up the next morning to do it again. I learned loyalty goes beyond legacy. And I learned that being true to the blue infused into my bones meant having the tenacity to write my own rulebook. Now, when I recount my BYU story, which is to be served alongside a balanced breakfast of peach smoothie and whole-wheat toast, I ask: Have you ever been so happy that it reverberated through your bones? I have. It happened because of one word: accepted. See how BYU is planning to honor the great LaVell Edwards.